Book Your Dream Beachfront Rental Villa Now! Book Your Dream Rental Villa On The North Shore Now! This magnificent 6-bedroom dream beachfront villa is located in an exclusive residential oceanfront development between Sosua and Cabarete on the north coast of the Dominican Republic. 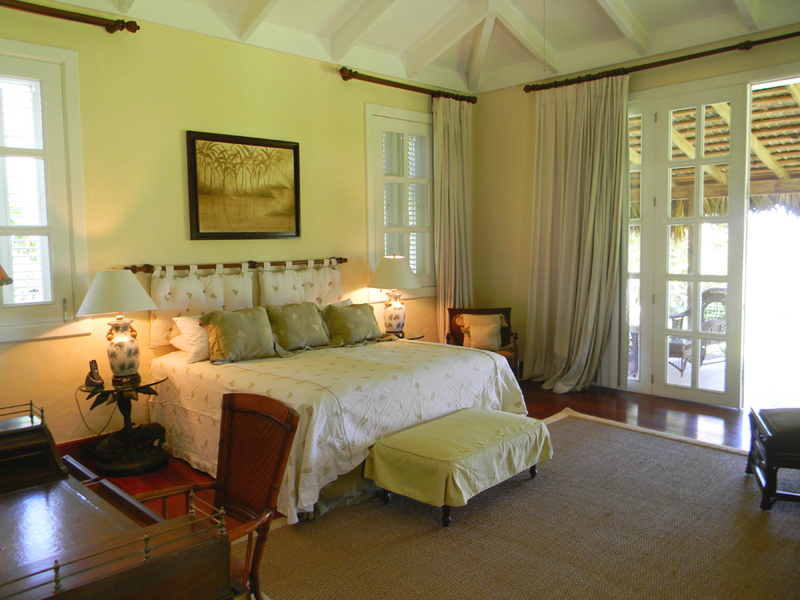 The villa was built with carefree, elegant Caribbean living in mind. 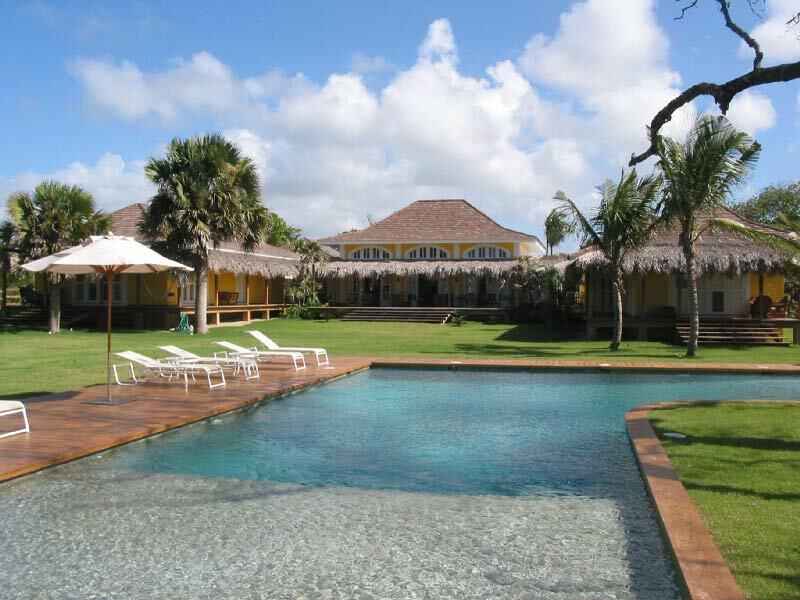 The U-shaped villa with its louvered doors and windows, vaulted ceilings and rustic beams reminds one of the elegant Caribbean plantation houses of a century ago. Imagine having a nice cool lemonade lounging by the large pool only steps away from the sandy beach! Enjoy the beach walk when the sun goes down! Imagine having a cocktail sitting on the broad wooden veranda! Imagine your dinner, fresh saltwater shrimps from Sanchez, sitting in the alfresco dining area surrounded by a reflecting pond! Make sure that your next vacation will offer you all this. There is a nice choice of Sosua restaurants when it comes to dining out in the Dominican Republic. The purpose of these food blogs is to write about where you, as a resident, would go to eat, where the expatriates go, not just the tourists. These Sosua restaurants are not just tourist spots. These are the places you eat on a regular basis. They are the reason you will live on the north coast of the Dominican Republic. 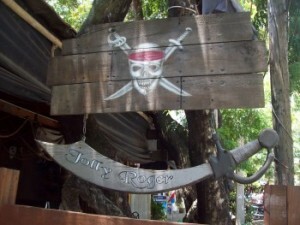 They have character and tropical ambiance—the perfect places to hang out, have good conversation and make new friends. These are about socializing, not just dining. Expatriates own most of the restaurants rather than Dominican owners serving Dominican food. At the top of the list is the English. We go to establishments that are about a sense of place, the tropics and the north coast of the Dominican Republic, which is why we are here in the first place, rather than in Wales or Costa Rica. We also like the familiar, which is why we sometimes go to restaurants and bars like the Jolly Roger, Rocky’s Blues Bar, the Cuban Café (also for real Cuban cigars, no knock-offs), or Big D’s Place for bar-b-que at 109B, Sosua Beach. 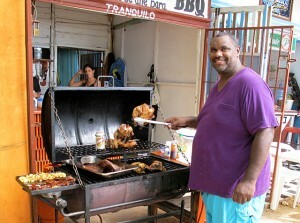 If you have a hankerin’ for some bar-b-que done the easy way (someone else cooks it), then Big D’s Place for bar-b-que, at 109B, Sosua Beach is the place to go. Better than back home, because you can enjoy it sitting on a beach lounge looking out on the crystal-clear waters (really—you won’t believe it till you see it) of Sosua Bay. La Puntilla de Pier Giorgio is a very popular gourmet, an Italian restaurant on a cliff overlooking Sosua Bay and the ocean. The restaurant, and the Pier Giorgio Palace Hotel of which it is a part, is the dream and creation of Italian fashion designer, Piergiorgio. Menu items include classic beef carpaccio, homemade pasta dishes, fresh local fish with a Mediterranean flare, or grilled lobster. Infiniti Blu restaurant is located in condominiums. It is modern, without being stark. The menu matches the décor, unique, modern, simple, yet tasteful, and also maintains a sense of place (the tropics) in much of its selection with items you are unlikely to see elsewhere. This would include fresh squid stuffed with rice and shrimp among the entrees. Being that Sosua is an international town, you can expect international dishes such as Olivier Salad, cubes of potatoes and chicken, a Яussian appetizer, or the popular, light Mediterranean fare such as Tzatziki, cucumber yogurt served with pita bread.